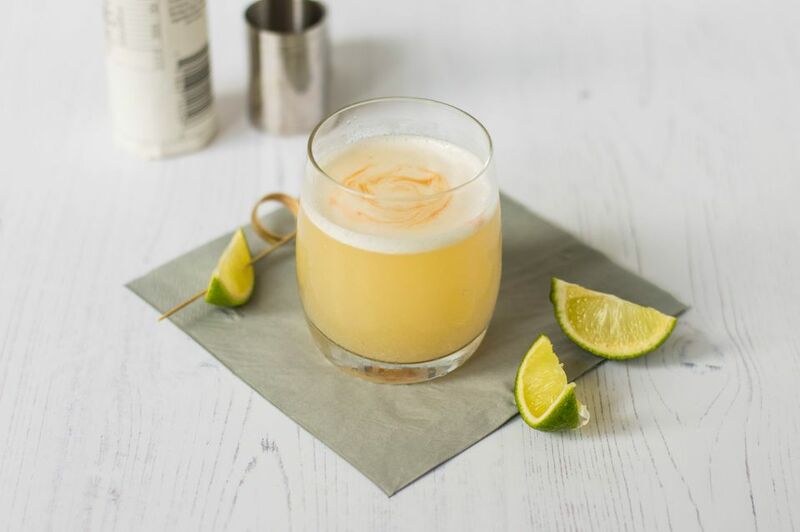 There are many ways to make the famous Peruvian pisco sour cocktails, so it's best to know the fundamentals before attempting a variation. The basic recipe includes pisco brandy, simple syrup, lime juice. With that goes egg white and a sprinkle of Angostura bitters. Mix the pisco, lime juice, simple syrup, and egg white in a cocktail shaker. Add ice to fill, and shake vigorously. Alternatively, you can use a blender if you don't have a shaker. Strain into an old-fashioned glass, and sprinkle the Angostura bitters on top of the foam. Tip 1: Very tart lime juice is essential. Many recipes call for lemon juice, possibly a translation error from the Spanish word limon. Limones are actually small South American limes, similar to key limes (also known as "Peruvian lemons"). Tip 2: Remember that the skin of limes has a lot of essential oils that can be a tad too bitter and sour, so when squeezing your limes, be sure to keep the flesh side facing down and not running down the lime peel. Also, don't drop the lime in as garnish after it’s been squeezed into your drink as it will also tamper with the taste. Tip 3: Keep the simple syrup really simple. You can use any recipe for simple syrup you want, but the easiest and yummiest option is to forgo the weird sweeteners, artificial sweeteners or expensive syrups and just do 1:1 ratio of sugar to water and mix. Tip 4: Don’t be scared of using real egg whites. You can always use pasteurized liquid egg whites from a container, but the texture is not quite the same and can affect the look and taste of an authentic pisco sour. Tip 5: Shake your cocktail well so that when you pour it into an old-fashioned glass, you get a nice 1/2-inch layer of foam on top. Tip 6: Don't stress if you don't have Angostura bitters on hand, you can do without. Instead, you can try a sprinkle of cinnamon on top of the foam, but that is not necessary either.